The drawing certainly looks right. In pen and ink and lightly shadowed, an anguished-looking Saint Sebastian is tied to a tree, wide-eyed and wild-haired, and about to be shot through with Roman arrows because of his Christian faith. (Miraculously, he will survive the arrows, though later, according to The Golden Legend, a medieval encyclopaedia of the lives of the saints, he was clubbed to death.) Aside from a loincloth, the saint is naked, his neck craned toward the heavens, arms bound behind the twisting tree trunk, awaiting the bite of the first arrow. The flip-side (the verso, as opposed to the recto, or front side, of the drawing) contains some optical studies (lines and planes), some sketches of light and shadow (crosshatching), as well as text that appears to be in Leonardo da Vinci’s hand. The drawing has been called ‘quite incontestable’. The French government agrees, pronouncing it a ‘national treasure’, a ‘rare item’ and ‘a precious testimony to the genius of Leonardo da Vinci’. Much is in the balance. To find a new Leonardo is to strike the purest vein of artworld gold. But only a few dozen of his works exist worldwide, and one of them sold recently for more than any other artwork in history. Leonardos have become a cultural currency, so to have discovered a once-lost drawing is a position of enormous potential power. If it is authentic, of course. The French seem to think so, but are they right? And how can they be sure? When I saw the work, it was mounted, and on the mount was indicated ‘Michelange’. When I saw the drawing, I immediately thought: ‘It’s not Michelangelo, it’s Leonardo.’ The first thought I had. It’s an enormous thing. I look at the drawing itself more precisely. The technique was one I knew, the pen and ink from the first period of Leonardo. I remarked that it was a left-handed work, which I could tell from the way the shadows were made. Leonardo was left-handed. His students were not, and left-handed forgers are even rarer than right-handers skilful enough to pull this off. It was a compelling clue. My first perception was a good one. Then I saw that the drawing was not glued onto the mount, and on the left you could see that it had been turned often. When I turned it, I saw the inverse inscription. When I saw the optical sketch, I was even more certain. I had adrenaline running through me. The text was left-handed. This particular drawing rang a bell somewhere deep inside this connoisseur’s mind, or perhaps his soul, if we’re being poetic, because connoisseurship is nothing if not a resonance in the soul. It has also become something of a naughty word in art history circles: the deep, innate understanding of an artist’s hand, what might prosaically be called getting a ‘vibe’ when confronted with an authentic work by someone whose oeuvre you know inside and out, is dismissed by many as something of a parlour trick. There is an element of divination to the way many art experts describe, or insist on not describing, just how they ‘know’ that a work is authentic. This attitude (‘I know this and you do not, and I’m not bothered to explain myself to the likes of you’) can be off-putting and deepen the sense of elitism in the art world. But the art world has always been elite, particularly at the high end of the trade, and in academic journals where experts dig out specialised trenches and fire off weaponised articles. To be the world’s go-to expert in X is the goal: hence any colleague with a claim to expertise is also competition. When de Bayser wondered if he might have a Leonardo drawing suddenly upon his desk, he logically turned to arguably the leading Leonardo drawing expert in the world, Carmen C Bambach, a curator of Italian and Spanish drawings at the Metropolitan Museum of Art in New York. Bambach quite literally wrote the book on Leonardo drawings: she organised the catalogue for the Met’s 2003 exhibition Leonardo da Vinci, Master Draftsman. In the world of Leonardo scholarship, she has perhaps only one peer: Martin Kemp, emeritus professor of the history of art at the University of Oxford. But while Kemp might be the most prominent Leonardo scholar in general, Bambach is a subspecialist: when it comes to drawings, she’s the one to call. But how, precisely, would her conclusion be reached? How does she determine whether or not this is a Leonardo drawing? More to the point, should we believe her, and what happens if forensic testing suggests that she might be wrong? Lost works by Leonardo have resurfaced with encouraging, even surprising, frequency in recent years. In 2005, Leonardo’s Salvator Mundi was acquired by a consortium of New York-based dealers who had it restored, because centuries of grime had clogged its sombre beauty. It was so unrecognisable that it had been sold in 1958 for just £45 ($1,350, in today’s money), its authorship long-forgotten. After featuring in the blockbuster 2011 Leonardo exhibition in London, it sold to the Russian billionaire Dmitry Rybolovlev in 2013, for $127.5 million, which was a record price increase for an artwork (around 283 million per cent) – until it sold again, in December 2017, to the Louvre Abu Dhabi for $450.3 million. With Salvator Mundi, the work looked good and the provenance checked out. The conservator Nica Gutman Rieppi, who examined the painting and corresponded closely with the hands-on team of conservators over several years, reassured scholars and potential buyers alike that the investigation was undertaken with a healthy initial skepticism, which was wiped away by deep forensic analysis. But it was the painting’s inclusion in the London exhibition that was the official stamp of approval, guaranteeing its authenticity (and its notoriety). Traditionally, drawings and prints circulated around collections, and artists often created their own versions of works based on prints and drawings by artists they admired. There are many paintings of Leda and the Swan, for instance, inspired by Leonardo’s original (which is lost, last seen in 1625 at Château de Fontainebleau in France), with numerous artists trying their hand at copying it. Then there are works created not by Leonardo but by his studio – apprentices, students, assistants. A copy of Salvator Mundi by Leonardo’s pupil, Salai, sold at Sotheby’s in 2007 for $656,000. That’s a nice chunk of change, but a far cry from $450.3 million. It looks Leonardo-ish, just not as good. Why is this distinction important? From a historical perspective, precious few Leonardo paintings survive: between 15 and 20, depending on which scholars you agree with, so any new Leonardo painting is big news. But financially, there is a world of difference. A copy after a lost Leonardo original, even by an established artist such as Salai, is worth around 686 times less than the original would be. I think they did the right thing, judging from what I read about it. A curator looked at the drawing with the unaided eye, but with lots of experience. Following this, it was shown to Dr Bambach, which is what I would have done, too. It also seems that the drawing (and the text on the reverse) are such a perfect match with several other sheets that exist, that there is not much doubt. But a prominent Leonardo specialist, who prefers to remain unnamed, is not at all convinced. The frea, verso, side of the drawing. Photo courtesy Tajan. It would be nice if the Tajan auction house laid all its cards on the table, publishing test results and the complete provenance. But there is no precedent for this in the art trade. The general attitude toward opacity, centuries old, remains: we are the elite experts; we have specialised knowledge that you do not; we will tell you what is genuine, and you will believe us. Consider the three steps to the authentication process: connoisseurship, provenance, and forensics. All three bases were covered with Saint Sebastian, although precious little information has been made public to date. The aesthetics are in its favour. The drawing doesn’t look too perfect, too refined. The artist wasn’t sure how he wanted the saint positioned – he drew the legs in several different positions, and the tree before the saint (we can see lines delineating the tree trunk through those defining the saint’s legs). As The Guardian’s art critic Jonathan Jones pointed out in 2016, the sketch has ‘blobs of ink … gathered on the figure’s raised arm, and also to form his dark, shadowy belly button. That pooling of ink is so Leonardo. To me, that’s a massive clue.’ He’s right, but also correct in his use of ‘to me’, because aesthetic judgment calls are notoriously subjective (recall that some past connoisseur wrote ‘Michelange’ on this very drawing). But those are the details that distinguish authorship and help to determine that a work is not a copy. In general, you would look first at how the drawing materials were used: type of brush and/or pen. You would look at the gestures and movements of the lines (hesitations, boldness, corrections, directness, curvature, and so on). How does the ink look: are there areas where the ink pooled together, transparency … and compare all these things with firmly attributed drawings. There are similar, established works by Leonardo to which this can be compared. He is known to have sketched in a similar manner, with shifts in positioning (as in Saint Sebastian’s legs) drawn onto the same picture. A drawing of a horse with multiple leg positions comes to mind, as well as his most famous drawing of all, Vitruvian Man. Then there’s the fact that recto and verso were used. This is not unusual – vellum paper was a prized commodity in the Renaissance, and all parts were used where possible. 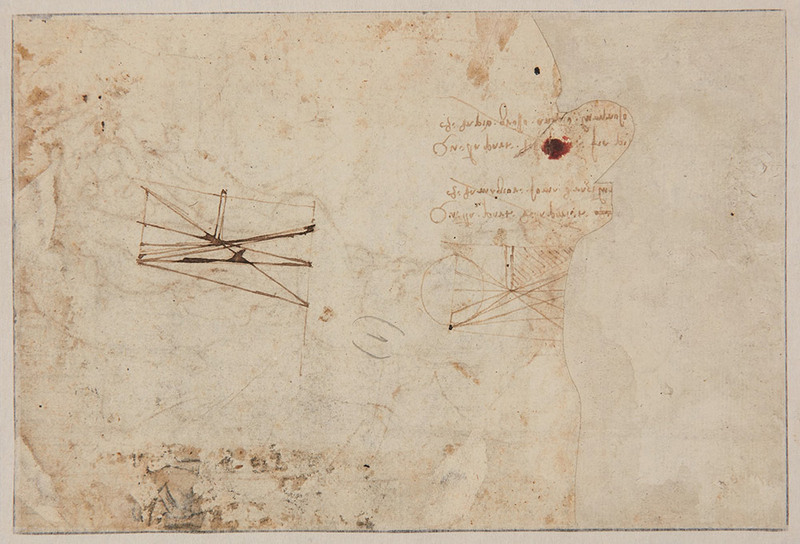 But the combination of a preparatory sketch for a painting on one side, and optical diagrams, plus Leonardo’s distinctive handwriting, on the other, add to the aura of authenticity. If such a work satisfies the expert’s naked-eye scrutiny, then it goes to the second test of authenticity: provenance research. Provenance is the documented history of an object’s ownership, and includes historical documents suggesting that the object fits into known history, that there is some trace of, or reference to, its having existed, lending credence to the possibility that it is a lost work, now found. Saint Sebastian fits the latter bill. In one of Leonardo’s notebooks, called The Codex Atlanticus (filled between 1478-1519), Leonardo mentioned eight drawings of Saint Sebastian made in preparation for a painting that he would never complete. One of those eight drawings is extant (at the Hamburger Kunsthalle). This would appear to be another of them. The other 13 works in the same collection were also Old Master drawings, some of them are copies, two or three are quite good quality, but we don’t know the artist yet. All on the same mount, which is interesting for the provenance. All the mounts seem to be c1900, they all have the same hand inscription on the mount. The drawing comes from an album, because on the stretcher you can see that it was cut down, and taken from a larger album. This means that there must be other drawings from the same collection and the same mount. But I didn’t find any myself. Since the provenance findings have not been made public, we can only assume that Tajan has done its proper due diligence. The final hurdle in establishing an artwork’s authenticity is forensic. An array of non-invasive scientific testing methods is available that can help assure an object’s age, but these cannot guarantee authorship. Perhaps surprisingly, forensic testing is rarely turned to in the art trade, even with such extremely expensive items as this one. If an object looks good, and the provenance checks out, then it is usually accepted as genuine, and sold. Forensic testing usually takes place when some red flag is raised in the connoisseurship or provenance studies, or if someone who acquires it later grows suspicious. In this case, Saint Sebastian was likely tested at the Louvre in November 2016: since ‘it was listed as a tresor national by the Ministry of Culture shortly after, we can assume the results were positive,’ says de Bayser. Besides, a government wishing to keep the work in France would have wanted to confirm its authenticity before committing tax-euros to purchasing it. Forensic tests are best at spotting anachronisms, details that might give away an object’s imposture, like some pigment or material found in an artwork that post-dates the period in which the work was supposedly created. The German forger Wolfgang Beltracchi, for instance, was caught when titanium white, a modern substance, was found in 2008 in a painting ostensibly created before titanium white was available. Testing can also date organic material (such as paper) to a certain period, often accurate to within a few years. What forensic testing almost never does is guarantee authorship. It is better at weeding out than honing in. Presumably, when this work was tested, no flags were raised – everything dated as it should to feasibly allow authorship by Leonardo. Effectively, science offered a double-negative to support the conclusions of the connoisseurship and provenance examinations. But art history is pocked with compelling copies, often by members of an artist’s studio, as well as forgeries, which can tax and strain even the most assured expert eye. This is why the double-negative assurance (the business of authenticating originals) is so important. The art historian Katy Blatt’s 2011 book on Leonardo’s painting The Virgin of the Rocks concerns two versions of it – both by Leonardo. ‘Historically, the second Virgin of the Rocks at the National Gallery, London, has been seen by scholars as a lesser copy,’ she said. Having the painting authenticated ‘was helpful to maintain [the gallery’s] standing as a global centre for art treasures; and it certainly boosted their ticket sales; the 2011 Leonardo exhibition attracted 323,897 visitors, more than six times the numbers normally admitted to exhibitions.’ Concern that Salvator Mundi might not have been the real McCoy was such that the scholar Jehane Ragai added a section on it to the second edition of her book The Scientist and the Forger (2015). There is also precedent to illustrate the dangers of a most prominent scholar authenticating a work with certainty, and leading others to follow. During the Second World War, the art forger Han van Meegeren tricked the world’s leading Vermeer specialist, Abraham Bredius, into authenticating his forged Vermeers. When Bredius pronounced them to be part of a long-lost period and some of Vermeer’s finest creations, other scholars in the field did not dissent. Van Meegeren was able to sell his ‘Vermeers’ to the Nazi art aficionado and head of the Luftwaffe, Hermann Goering. It was only when van Meegeren went on trial after the war, for having sold Dutch cultural heritage to the enemy, that Bredius’s embarrassing error was made public. At first, no one believed that van Meegeren had actually sold Goering a forgery (and therefore, he argued, he should not be executed, thank you very much) because of Bredius’s belief in its authenticity. Only when van Meegeren painted another ‘Vermeer’ while incarcerated did the egg on Bredius’s face come clearly into view. When de Bayser called Bambach of the Met, whose informed, yet inevitably subjective opinion can add so many zeroes to the value of an artwork, she proclaimed the Saint Sebastian drawing to be ‘quite incontestable’. It was, she added, ‘an open and shut case’. Most of the world agreed, but it was her revered opinion among Leonardo scholars that propelled agreement. France is all in. On 5 January 2017, the Ministry of Culture announced a temporary export ban on the drawing, giving it 30 months to match the €15 million asking price and first dibs on buying it. Now Bambach is planning an academic article to provide the first in-depth analysis of the drawing. It would be nice if the provenance and forensic test results were published along with it. But this is not always the case. Owners and dealers are notoriously reticent about provenance, considering it a private matter – but in recent years the most conscientious members of the art world have taken care to be transparent and publicise as much of an object’s history as is known, thereby demonstrating that there’s nothing to hide. It remains unusual for forensic test results to be made public (if they are made at all), but they are still the most compelling way to assure that an object is not a forgery: almost no fraudsters in history have bothered to create forgeries that would fool conservators in their labs. They don’t have to. If the work and the provenance (which, alas, can also be forged or doctored) both look good, forgers know that it is highly unlikely that the work will be tested at all. One thing is for sure: the French government has given the drawing its stamp of approval, which means that, whether or not it can raise funds to buy the work, the world believes this to be a Leonardo. Its decision – and a €15 million investment – rests largely on the personal opinion of a single expert – Bambach. ‘My heart will always pound when I think about that drawing,’ she told The New York Times in 2016. That is not to say that she is wrong – I’m quite certain that she is right. But for all the technical gadgetry available, art-world decisions still rest largely on the subjective conclusions of individual, ultimately fallible, specialists. Forensics merely help matters along. There is much hanging in the balance for only a ‘feel’ as guide. As we have seen with the acquisition of Salvator Mundi by an Arab billionaire, Leonardo’s works have become trophies that indicate cultivation, wealth, cultural preeminence. To own a Leonardo is the highest sign of erudition. The fact that Salvator Mundi (whose public stamp of official approval came more by way of curatorial say-so than through the hard work of conservators), is – by several hundred million dollars – the world’s most expensive artwork, is a bonus in a world in which superlatives summon the most headlines, and where wealth and cultivation are thought to go hand in glove. Now the Louvre Abu Dhabi has its iconic showpiece, effectively putting Abu Dhabi on the high-culture map. 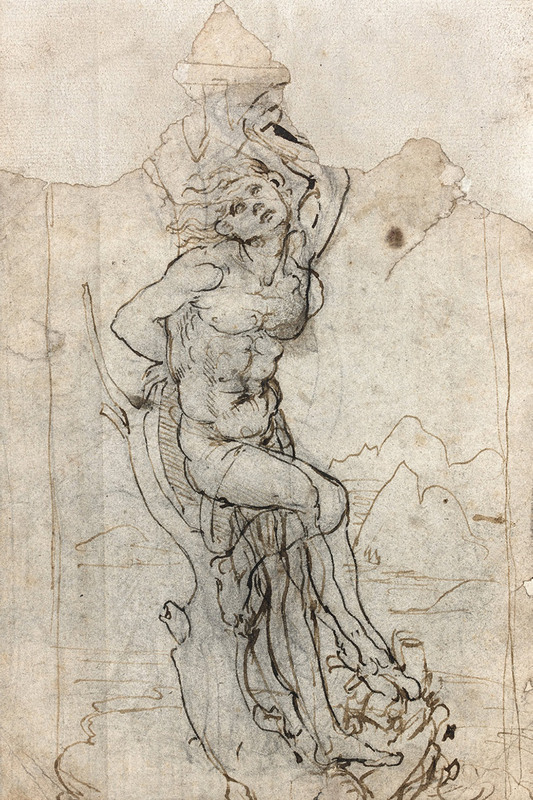 With only a few dozen works across the globe certain to be by Leonardo’s hand, even a relatively simple and small drawing, such as our Saint Sebastian, bears a weight of expectation – and quiet desperation – for its authenticity far greater than its few grammes of mass.